I can't find anything about it on google & forums so i am asking on this forum. What repo did you clone from? I have never added anything to .bashrc, so those items might help, but they should not be required or even needed. It should be enough to run the make commands from the cloned repo directory, so your error seems peculiar. Normal/usual Linux host variant, nothing exotic or ancient? When did this change, as it used to be a prereq in the Build System Usage wiki? "The build spawns multiple shells, some of which expect the toolchain binaries to be present in the PATH." I have simply created a new virtual Ubuntu host every three months, installed the prerequisite packages, cloned the main repo and that has been enough for building the firmware. Yeah, the benefit and problem with wikis is that everybody can edit them, so sometimes the advice goes too deep or has items tweaked toward somebody's own preferences or system peculiarities. "newBuildroot.sh" creates the whole repo with patches into a clean Ubuntu host, and no changes are done to PATH and other variables. I had no experience compiling before I began compiling OpenWrt in 2015, so I relied heavily on the Build System Install, Usage, and recently the Build Environment, wikis to get me started. Since I run multiple VMs which use Bash, I have a master bashrc that I copy between all, editing when need be, and I've never tried building without those in my bashrc. It never occurred to me to check and see if any of the information had changed in the Build System Usage wiki. Thanks for your thread link, it's quite informative =] I have a couple of questions about your newBuildroot.sh, however I'll ask them in your thread. Well, i think it was just my fault. The clone was normal and i am using ubuntu xenial and LSW (windows bash). I tried multiple times both ways and i got the same error. Also i didn't say that this happened only in the x86_64 configuration. 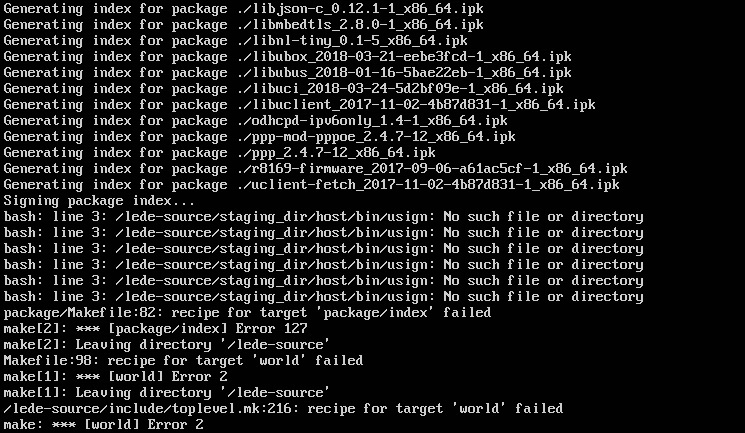 Finally, i noticed the package usign was not checked in menuconfig. I hope i unchecked it without noticing and it is not something more complex.